can assist the soldier in land navigation. Condition: NEW Silva is considered by many to be the world leader in military compass design. This model, the Silva Type 4 / 54 compass, is no stranger to special forces units around the world. 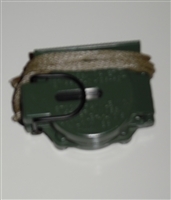 This Silva military compass is very lightweight and rugged and uses tritium for low to zero light conditions. The Silva Type 4 / 54 compass is very flat so it can easily fit in a shirt pocket or other compact flat storage area. These units are military surplus so the tritium may be slightly dim to very dim on some compass units. Overall they are in good working order, I keep one from this lot in my go bag if that says anything. Nylon lanyard included. Genuine U.S. Military surplus Sandy-183 compass. The Sandy-183 compass have been used by U.S. forces for decades due to their ruggedness, extreme ability to function accurately regardless of weather conditions. The Sandy-183 compass features tritium dials for low light to zero light conditions. (these Sandy-183 compasses are military surplus, old stock and the tritium is very dull but exposure to bright light can temporarily bring them back to life. Hands down a great compass!